Congratulations to Rachel at Lawn Tea, the winner of my book giveaway! And, congratulations to Angela, who will receive a "grab bag" of tea items. How exciting for them! Congratulations! Congratulations to the winners! Lucky ducks! I thank you so much for the lovely book, and for all the adventures you've taken us on all over the world. I opened your e-mail very late last night, (after a VERY busy day with a five-year-old and house-cleaning for a brunch this coming weekend) and though I wrote you immediately, the whole thing must have seemed like a fantasy. This morning, I had to look in my e-mail to see if I'd dreamt such a nice event. I'd never won (and seldom entered) any drawing or giveaway, but this one was just so charming and beautiful. It's taken on the effect of the lovely seed catalogs which arrive during the dark snowy days of January, fore-telling the bright Spring to come, and I'm anticipating wonderful plans over a cup of tea. 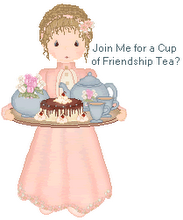 ps Thank you to all the commenters today---Linda's very special, and I know you all really enjoy visiting Friendship Tea as much as I do. Yay, me! And thank you!